“….miles to go before I sleep….” by Trail Zombie is one of my favorite blogs. 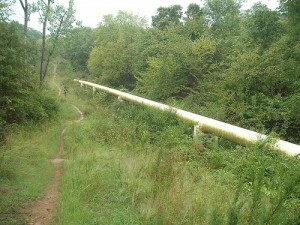 TZ runs incredible distances most of it on trails. TZ runs marathon and longer distances (ultra Marathons). He runs at all hours of the day and night. He probably runs more miles on a weekend than I do in a month. He belongs to the local trail running club, TATUR, and helps mark the courses for the races they run. 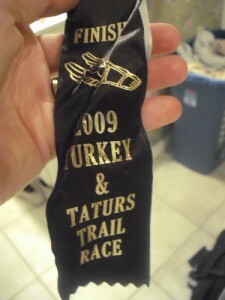 TZ makes the races sound fun so I decided to do their next one, the Turkey & Taturs Trail Race held Sunday. The race had three different lengths, 50K (30.1 miles, longer than a marathon which is hair over 26 miles), 25K (15.5 miles) and 10K (6.2 miles). Wimp that I am, I chose the 10K race. I have run in lots of road races. 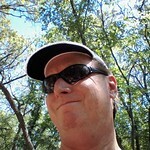 I’ve done two marathons, two half marathons, a 20K race, fifteen 15K races, and a whole boatload of 10K, 8K, and 5K races. They are fun, but I’m always looking for something different. The trail race was different. First, there are not that many people which makes it less of a mob scene, second it is pretty much an event for the 40 and over crowd it seemed to me, and second the route is very primitive. (That is why they call it a trail run, duh). Third, you can wear headphones and listen to music (Yea). The course is the thin red line. The 10K basically was the top half of the map. You can see the course twists and turns so much that the map is useless. 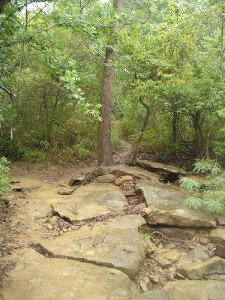 Turkey mountain is laced with dozens of different trails and hundreds of different trail combinations. If you get off course, you are toast. After just a half mile I was running by myself, so I kept a sharp eye for the pink ribbons marking the course. It would be easy to get off course and if you do, you are lost, you are so turned around it would be difficult to know where to return to the start. Just to add to the fun, it started sprinkling just before the race and it turned into a full blown rain later on. It was not cold and I was wearing technical fabrics so that wasn’t any big deal and it wasn’t lightning, which would be the deal stopper for me. The course web site said they wouldn’t cancel the race for rain anyway. I think these guys like rain and mud. 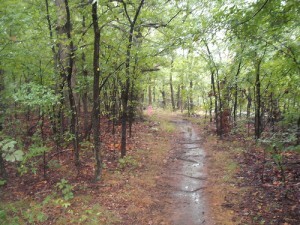 It was kind of fun, running through the woods splashing through the puddles with abandon. Here are a few pictures I took during the run. Let me tell you something I learned about the brown mud. Its slick as snot so I picked my way carefully through it. I got passed by runners doing the 25K race and they would just fly on past, as did a couple of grandmothers and a great greandmother on walkers. They can be pretty rude with their little bells. 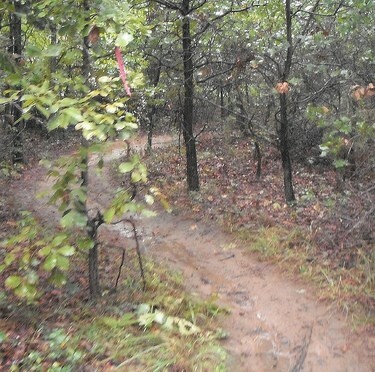 See the darker mud, it was pretty slippery so I had very slow going on it also. 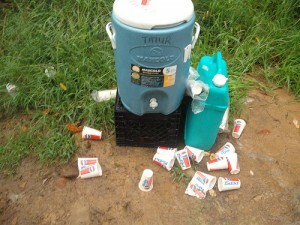 This is a water station about halfway through the race. See all those cups? I think it means that I’m not in the lead. I blame all that brown and black mud. I wasn’t getting my heart rate up enough on the course, so I stopped and did a little workout on this treadmill so I could stay warmed up. (Not really). Why the heck do people pick city parks to dump their trash? I award the people who dumped this here a poop hat award. If you live in Tulsa and have a large object you want to get rid of, you call the city and they will come get it. No cost, no questions. You don’t need to dump it in a city park!!! Good grief folks!!! Lots of rocks on the race. They were very slick when wet so I went over them slowly to avoid hurting myself. I didn’t get a picture of it but finally ran into some good running terrain. Lots of nice grass right before the finish. I have learned over the years to be running hard when you make the final turn to the finish line. You have to finish with style. If you cannot finish with style at least finish vertically. I did my best to ignore the knowing smirks of the grannys that passed me earlier. I think they cheated, I know they did! And now for my lady readers, a little beefcake. Control yourselves, I’m a married man, not available. Sorry. Running in the mud is fun!!! And by gum, I got my participant ribbon!!! I’m the king of participant ribbons. Sometimes they run out before I finish a race though. But you know what the important thing about racing is? The physical and mental challenges, communing with nature, rocking out on the headphones to the like of Metallica and Patsy Cline, becoming one with the universe, exploring the inner realms of your outer consciousness (or is it the other way around?)? No, none of that. I had lots of fun. 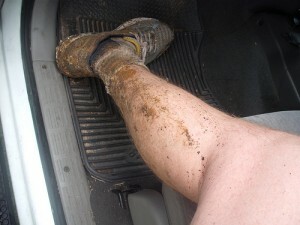 I didn’t get to meet Trail Zombie but I will because this wasn’t my last Trail Race! 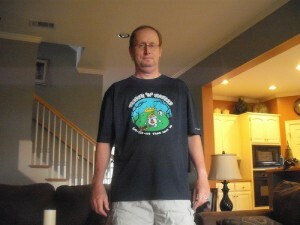 This entry was posted in Running on September 14, 2009 by Alan Bates. Nice legs. Now I know why Sweetie married you. Ha. Congrats on finishing the race. 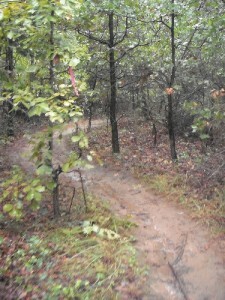 The first 5k for the Autism run had a stretch of trail run to it. A man fell and split his head open and we stopped to help him until the EMTs arrived. I decided it was one more good reason to stay away from mud. I was LOL@This is a water station about halfway through the race. See all those cups? I think it means that I’m not in the lead. I blame all that brown and black mud. I saw the red-lined marked trail on the map and had a ♥attack just looking at it…that is so awesome alan that you ran and got your ribbon AND Tee! Good for you getting out there and running! I hate mud and people’s trash too. Great post! 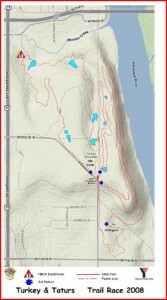 Last week they held the Wasatch Front 100 mile run with an elevation gain and loss of almost 27,000 feet. The things runners will do! Glad you enjoyed yourself!! Also glad you ran a bit on the treadmill. Seems the course was .15short, and everyone was supposed to run a few minutes on the the treadmill to get their distance. If you finish, you win. It’s all about getting the shirt. Waytobe! @Baloney – Man taking care of that guy really killed your time in that event. Were you sure it was worth it? @George with two hearts – thank you. @Mountain.mama – that sounds like quite a race. I bet TZ could do it. @Tulsa Gentleman – Hey, you get it!! @Janie – yep 10K is all about the mind, and the legs, and the lungs, and the mind. @Jenn Jilks – thanks for checking in. @Pacey – It was kind of fun. But I was ready for it to end. I admire you Yogi.. No matter what I do I hate to run. When I am at the gym I am rather OK on the mill with a TV infront of me. 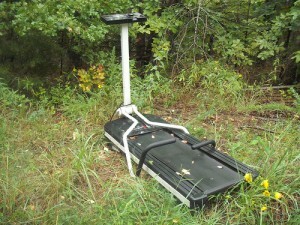 But when I am outside I dont know why I got bored so easily..
You should submit that photo of the treadmill to reddit. those time-wasters on that site seriously dig nonsense like that!